The two brothers arrested for allegedly beheading their neighbour’s 10-year-old son, Joseph Makinde, have said they committed the crime to raise money for a naming ceremony. Ayodeji Obadimeji, 20 and his elder brother, Saheed, 25, gave gory details of the murder of Joseph, whom they confirmed was the younger brother to their friend, Femi. They said the boy was first stabbed in the neck before his head was cut from his body with a knife. 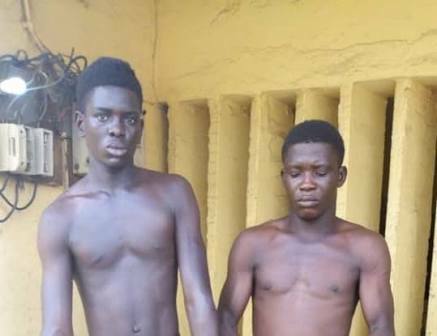 Policemen on patrol on November 28 at Shapati bus stop, Ibeju-Lekki, Lagos, arrested the duo while on their way to collect money from a suspected human parts agent. According to the suspects, Ayodeji, whose lover had a baby girl a few days before the incident, was contacted for the business by his friend, Sodiq Abefe. Ayodeji said: “I was desperate for money. I needed money by all means for my daughter’s naming ceremony. My girlfriend was delivered of a baby girl and the naming ceremony was drawing near, but I did not have money to buy ram. “Sodiq knew that I needed money badly for the ceremony, so he came to me with his friend, Don, and told me to help them deliver a human head to an agent. He said they already had the head and that I should not be afraid since I was not going to kill anyone. “He gave me a bag to bring on Tuesday to an uncompleted building where we agreed to meet. So, I told my brother about it. At first, he objected, but later agreed to follow me because I have not been to that place before. “It was an uncompleted building in a hidden street. We got there around 7pm and met Sodiq and Don. They said the human head was no longer available and that we needed to get someone to behead. Sodiq said to make money was not easy. That I should be courageous. He said he and Don would do it for me if I couldn’t do it, adding that we should just get a victim. “For about 20 minutes that we were there, all the people passing were in groups of three or four. There was no one passing alone that we could easily attack. So, Sodiq suggested that we should go to a busy area to lure somebody. “It was my brother, Saheed, who went to get someone. Since he’s a Lagos boy, we agreed it would be easier for him to convince someone to follow him to the uncompleted building. “When he left, I became unsettled. I started experiencing running stomach. I was at the backyard excreting when I heard him saying he had brought Joseph and sent him to do something. He said the boy would be with us in about five minutes. “The boy came and I heard his voice. I ran back to the building and asked the others why they wanted to kill the boy. Sodiq said to make money was not easy that we had to kill him. He said he had already stabbed the boy in the neck that if we should let him go, he would tell his parents and everyone how we wanted to kill him. Saheed confirmed that he lured Joseph to the ‘slaughterhouse’ by sending him on an errand to buy a non-alcoholic beverage. He said he gave the boy N200 to buy two bottles of soft drinks - keep one for himself and bring the other one to the uncompleted building for him. Saheed went on: “Joseph brought the two soft drinks to the uncompleted building and was drinking his own. I distracted him with a discussion so that Sodiq and Don could take action. As I was still discussing with him, they grabbed him from behind and took him to one of the rooms. “Sodiq stabbed him in the neck with a knife. We held his legs for Sodiq to cut off his head. Then, his head was put in the bag that Sodiq had given my brother and we left his body in the building. “Sodiq said we should leave the building in twos, which we did. We went to the bus stop in search of the agent who Sodiq was to give the head and collect our money, N200,000. “After waiting for a while, Don mounted a motorcycle and later returned with a man he said was the agent. My brother went to meet him and he said he would not pay M200,000 for the head again. He said what he had was N150,000 and Sodiq advised my brother to accept the money. 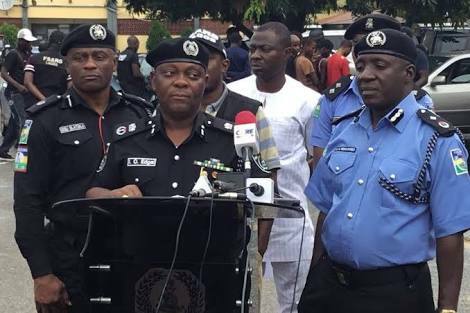 Police spokesman Chike Oti said operatives of the State Criminal Investigation and Intelligence Department (SCIID) Panti, Yaba, Lagos were trailing Sodiq, adding that the suspects would be arraigned after investigation.